Top Gun Paintball provides corporate paintball packages for mining companies at its extensive playing fields in Brisbane, Australia. Designed to develop strategy, teamwork and quick-thinking, this fun activity is ideal for teambuilding exercises. With ten different playing fields and a range of strategies available, Top Gun Paintball’s playing fields are some of the best in Australia. The company has been providing corporate paintball sessions for over 20 years. As well as providing a fun experience for all participants, Top Gun Paintball offers a service that is designed to have a beneficial effect on employee mentality and skills. Paintballing is an excellent source of stress relief, making it an ideal ‘treat’ for teams working in high-stress environments. If you are experiencing morale or teamwork challenges, or are opening a new mine site, an employee paintball day is particularly suitable. A paintball session will build an instant rapport among new workers, and can reignite a strong workplace mentality in a struggling team. 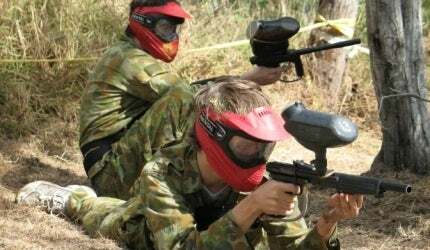 Top Gun Paintball organises cost-effective and highly flexible packages. Available for groups of 1 – 200, our packages start at $40 per person, with a special corporate package available at $90 per person. This package includes protective clothing and hire of Pro Carbine semiautomatic paintball guns, as well as a free pizza lunch and a trophy for the winning team. We can create specially tailored packages to suit your organisation, available for half or full days, on any day of the week. These can include catering, photography and / or videotaping. For employees wishing to attend but not participate, we also provide viewing areas for all of our playing fields. Top Gun Paintball takes safety very seriously and recently received a number one safety rating from public liability inspections. All participants are equipped with industry-leading face protection and camouflage clothing, with chest protectors provided to all female players. Before starting, all players are briefed on safe conduct and weapon use, and all games are overseen by our referees, who have considerable experience and a high degree of professionalism. Top Gun Paintball holds site liability insurance covering up to $10m. The paintball playing fields are located only 10km from Brisbane, and in easy reach by road or rail. Ferny Grove train station is only ten minutes’ walk from the fields, and State Routes 22 and 40 are just down the road. If you are interested in learning about Top Gun Paintball’s packages or services, please contact us using the details or form below. You have been working hard all year, so why not start your Christmas break off with a BANG - or a hundred! Welcome to the exciting world of Paintball Sports! Top Gun Paintball has over 60 acres of fox holes, bunkers, barricades, huts, forts, trenches, tyres, creeks and more. Top Gun Paintball is pleased to announce a special offer that will see the giveaway of a free Terminator pack worth $120 for every ten players who book and play in September and October 2013. On 21 July, Top Gun will host a ‘Scenario Day’ where players can play all day in an exciting scenario campaign. At Top Gun Paintball, we recognise the importance of work performance and the value of friendship that is created by fun team building exercises. After four months of development and building, our new Ruins field is now open. This exciting paintball field is one-of-a -kind in Australia, featuring a maze effect and bombed-out buildings.